After finishing the Cluny piece up last week, I sifted through a few other pieces of needlework I want to finish up and … ahem. Well, not to sound insulting… but I want to get them over with and out of the way! Makes it sound like I’m trying to plow through an Unpleasant Task, doesn’t it? But they are Loose Ends, and I want to tie them up while I’m organizing my Knuckle-Into-Summer List. That’s the list of Big Things I want to do this summer. And I’m more likely to knuckle into those big things, if I have some little things finished and out of the way. One of them is this Tanja Berlin embroidery kit that I wrote about a while ago. It’s almost finished. This section is looking a bit ratty right now, because that big center leaf needs to be added. It’s a piece of gold kid leather that I just need to sew on – not that difficult in concept, but I will admit that I’m not a huge fan of stitching on kid leather. It’s one of the only needlework endeavors where I invariably use a thimble – which is a pretty rare thing for me. The trick to sewing on kid leather (which is often used in goldwork – you can see an example of it in the last picture on this post about a Pelican altar frontal) is to pre-pierce your sewing holes in the leather (very helpful) and to use the smallest possible needle. For me, using a tiny needle on kid leather is much easier than using a larger needle. I’ll use a #12 crewel on this, I’m pretty sure. The smaller needle seems to slide into the leather more easily than a larger needle does. Besides the large center leaf, I still need to outline that whole swirl area with gold thread and finish up a little of the brown branch in the middle of the swirl. I need to give the fellow an eye and a beak still. Wow. Looks weird this close up! Just so you know, the actual piece is around 5″ high – so it’s fairly small. 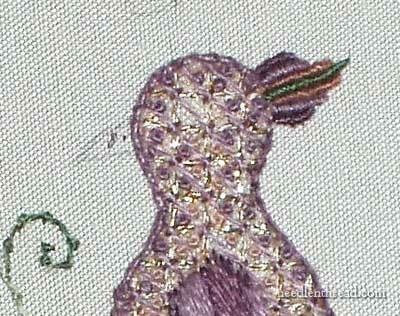 All the stitching is worked in one strand of DMC, so the stitching is fairly fine, too. The background fabric is a silk dupioni. And lastly, I have to finish the top of the tree, which will go pretty quickly, as it’s just block shading with satin stitch. 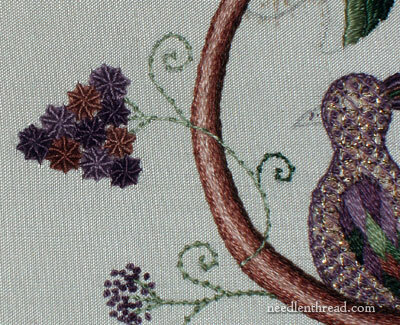 This little cluster of grape / berry thingies is my favorite part of this piece. They remind me of ….. So that’s one loose end I hope to tie up by the end of this week. What about you? Any loose ends or projects you’re trying to finish up? What’s your biggest hurdle when facing a project you want to finish? Is it time, is it motivation, have you lost interest in it? Or are you the type that charges to the finish? The new “Ask & Share” section of Needle ‘n Thread is almost ready to launch – I’m thinking June 6th or 7th will see the new section up. A little behind-the-scenes work to do there still. Other than that, just plugging away until this coming Saturday afternoon, when summer officially begins for me. April 18, 2013 Carrickmacross Lace Kit & Curved Scissors – A Give-Away! Oh wow, that is beautiful! I’ve ordered goldwork supplies from her, but not a kit as of yet. I might after seeing this. About the kid leather – that has ended up being one of my favorite parts of goldwork. I’ve tried all kinds of needles, including glovers, and what I’ve ended up using the most is the tiny little sewing sharps. They’re small enough to go right through easily and so far I have not had to resort to a thimble. The thread you use seems to make a difference as well. I use the ultrafyne thread you can get from the Golden Hinde in the UK. I’m sure there’s an equivalent for it in the US, but so far, I’ve never found anything close to it. I use it doubled like they recommend, and it glides right through the leather and never breaks. It comes in a variety of colors as well, and is semi-transparent. So glad you’re getting to finish up projects – I bet you’re ready to get started with summer. Can’t wait to see what you do next! Complimenti Maria, è molto bello ed impegnativo! Mi piacciono tutti quei punti e anche il soggetto!! Io quando comincio un lavoro, di solito lo porto a termine velocemente, ma non ho mai fatto le cose che fai tu, sei una vera maestra e ricamatrice! Sono ben lontana dal raggiungerti! !Buona continuazione! I am really looking forward to your “Ask & Share” section. It seems there are always a few pesky litle questions that I can’t find the answers for. Such as, when to separate the strands and when to leave them be? I know a lot depends on the project but I have yet to find a guide or resource. I love the colors, and the grape/thingies as well, but I’m sorry to say that they don’t remind me of those bottle cap candies. I had a big finish this past weekend, my Chinese Flower Project, and now I’m madly working to finish my silk stumpwork initial, a crocheted quilt and the crocheted baby blankets. Whew! Then this weekend I should be working on my son’s quilt – we’ll see how that goes. I have a tendency to lose interest in the project, not always, just sometimes, then before I know it a whole year can go by. I must learn to be more disciplined. Mary, you are going to feel so free, when you tidy up your work list like you have your workspace! You will be able to start the summer with nothing hanging over your head to finish. P.S. I love skittles,everlasting gobstoppers and *blush* candy lipstick. I know; we all have those ‘questionable’ projects laying around. I don’t understand it fully, though, because it starts with some inspiration of doing a technique or using certain colors or threads, but partway thru , the excitement fizzles! That is the oddest thing I’ve ever seen and I mean that in a very good way. 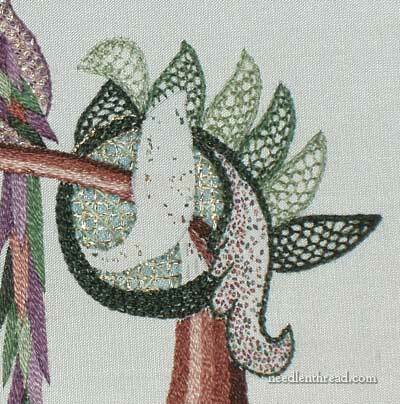 It’s not the usual stitches you’d expect to see on embroidery. Even with the close up of the bird body, I’m trying to figure out how many different threads you have there and what you’ve done with them. The branch is so realistic. The grapes remind me of those Brach’s chocolate stars. What an amazing pattern. Please do finish it. I’m sure it’s full of other surprises. One of my hurdles in getting my projects done is the fact that I love to give gifts I have made and that often means a bit of needlework. Right now a tote bag with a hand turned appliqué and embroidery panel must be finished by Thursday for a gift for my classroom coordinator and a onesie for a baby that’s almost here needs a robot or two. The panel is done but the tote bag isn’t and attaching the panel calls for more handwork. The scarf I’m crocheting can wait till fall. I have a Tanja Berlin burrowing owl kit I am dying to get to but first I should finish a cross stitch throw kit I bought in 1985 and found again recently. It is an absolute lower case k kit. I am not as interested in cross stitch as I was long ago so I only pick it up once in awhile and am redesigning quite a bit of it. Anyone have a cross stitch pattern for a praying mantis? 🙂 I want it finished by fall so I can cuddle under it. What can slow me down horribly towards the end of the project is doing repetitive tasks. Right now I am finishing a little stumpwork thingy with two flowers, 10 detatched petals. It took me forever to do the petals (10! not amillion, just ten!). I finished the last one just now, finally ready to cut, I feel like I built a railway, lol. I usually try to dilute repetitive lengthy stitching between other parts of a project usually, so they don’t get so abysmally boring. Hi Mary, This is a beautiful piece! Your work in wonderful and it’s so nice of you to share the progress. I can’t wait until at least one of the kits I order arrive. My fingers are getting itchy. Could you please, please, please tell me what kind of stitches you used in your grape bottle cap thingies? I have been using your video tutorials to learn embroidery, and I’d love to add these little beauties to my collection of needle-doodles! 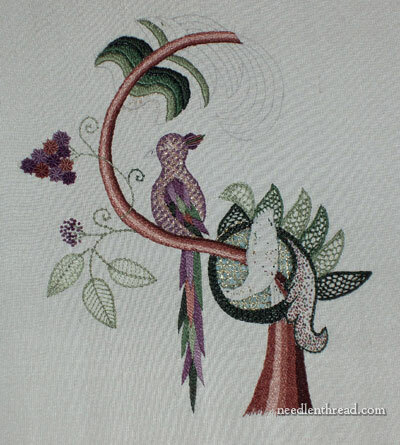 Now, if I could only get some time to actually stitch – haven’t had a chance for a good week now! Hope everyone’s have a great week! I am very excited about the section you are going to put on you site. It will be so much fun learning with everyone’s questions and sharing things we have learned. You always share so much with us. Happy Stitching. I have cleaned my sewing room and finished the needlework on a table runner today. It always feels like I’ve accomplished lots when I can put the sewing room in order and can know I no longer have to look at the same project that has been hanging over my head. This week I finished two UFO’s. It was a good week. This time of year the Oregon weather taunts me only to begin raining again. It’s not conducive to finishing things. However, my biggest hurdle to finishing things is…. probably me. Other than that, it’s the ADD. I have something to finish and start working on it. I see something else and start working on that. Then I see another something else and work a bit on that… Eventually things do get done and I’m not usually bored.